Arattupuzha temple is one of the famous Lord Ayyappa temples in Thrissur district of Kerala. The ceremony ArattupuzhaÂ pooram is called the greatest “Devamela on earth”. 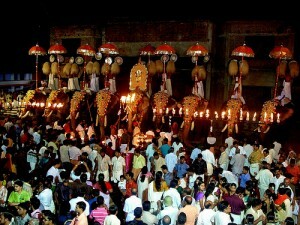 Arattupuzha pooram is celebrated for seven days. On the sixth day the final program conducted with sixty one caparisoned elephants bearing bright coloured umbrellas and parasols laid in the temple grounds, along with the temple music of panchavadyam, nadaswaram, pacharimelam and pandimelam.